What is the impact of air containment systems in data centers? 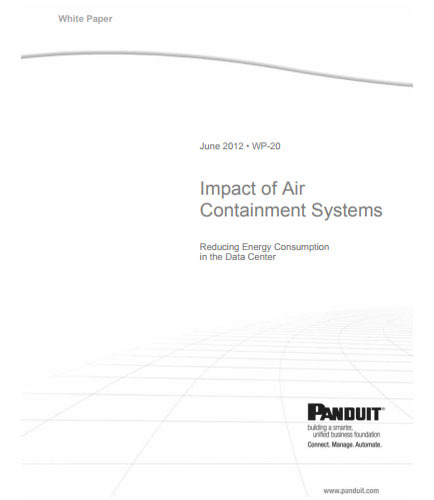 "What is the impact of air containment systems in data centers?" Data centers are the nerve center of successful business operations, resulting in surging demand for processing power, work load virtualization, and consolidation combined with pressure to reduce operating expenses (OpEx) and improve asset utilization. Most modern energy-efficient data centers deploy some kind of containment system— reducing the overall cooling energy cost by preventing or reducing the mixing of cold and hot air streams. Panduit has run several tests focusing on the comparison of common cold air containment and hot air containment techniques: Cold Aisle Containment (CAC), Hot Aisle Containment (HAC), and Vertical Exhaust Duct (VED) or Chimney with the goal to reduce energy consumption in the data centers. What is the importance of maintaining data center cooling energy efficiency? What is the importance of sealing cabinets? What are the selection criteria for Standard Hot Aisle / Cold Aisle (HA/CA) vs. VED vs. CAC? What are the types of air containment systems? How to determine ideal data center layout using economic analysis and CFD analysis? How to determine efficiency of cooling system with dry cooler, mechanical chiller and cooling tower? What are the opportunities in air containment systems for data centers?